So Moses prayed for the people. The Lord said to Moses, “Make a snake and put it up on a pole; anyone who is bitten can look at it and live." When Moses followed the Lord’s instructions to avoid conflict with the Edomites who had refused Israel passage through their land, Israel had no other option accept to turn south and go around Edom. This detour took Israel back deep into the wilderness towards the Red Sea away from the Promised Land which they had actually entered to fight a battle with the Canaanites who had attacked and taken some Israelites captive (Numbers 21:1-3). Israel went north into the Negev to destroy the city of Arad while in the Promised Land on a rescue mission. With the taste of victory in their mouths they were not pleased when Moses turned them away and led them south towards the Red Sea, or the Gulf of Aqaba. With this reversal in momentum and lack of water the people “grew impatient”, “spoke against God and against Moses,” and called the manna ballehem haqqeloqel, or “contemptible, worthless bread,” which is a word from the Hebrew verb qalal which means to consider something lightly, inconsequential and of no value. It basically means to curse something as worthless. Throughout the book of Numbers the pattern is consistent: When the people complain, the Lord sends judgment. And, so it is in this case, which is also the last documented case of Israel’s complaining about food and longing instead for Egypt on record. The punishment came in the form of “fiery” serpents, or sarap serpents, which means “fiery,” or “burning,” which most likely referred to the burning inflammation the snakes’ venom caused their victims who were bit and dying. Moses interceded for the dying people and God told Moses to do something shocking. Moses was ordered to create an image of a serpent out of bronze (or, copper). In the midst of a culture that is to have no images, the Lord commands the leader to fashion an image of a snake, which is an animal used to symbolize sin and evil. The image of a serpent had been associated with Satan since the Garden of Eden. As Moses is fashioned this image the fiery serpents were still moving among the people and the people are still being bitten and dying. When the copper serpent is completed Moses is told to lift it up on a pole so that all who look at it will be healed and live. It should be noted that this is far from the sacrificial system and the ordinary tabernacle rituals which involve touching real things such as animals and blood, eating real food such as meat or bread, burning tangible incense or wood with real fire, or saying prayers and speaking real words of confession. The afflicted Israelites are to look at the snake on the pole to be healed of their deadly burning inflictions. The serpent is lifted up on the pole which means two things: one, anyone can see it; two, no one can touch it. This healing can only be accessed by sight. The person must willingly desire to be healed and then look at the serpent. There is no physical touching of a goat’s head, no physical smell of incense, no taste of the bread and no hearing of the priestly blessing. There is only the willingness to look and see to be healed. Jesus compares himself to this serpent on the pole in John 3:14-15 when he compares “looking” at the serpent to “believing” in the son of man. Parallels to Jesus the savior and the serpent on the pole are extensive. It should be noted that these events occurred near Timna which is 15 miles north of the Gulf of Aqaba of the Red Sea (Eilat). At Timna there is a copper mining site of the Egyptians where excavations have uncovered mining shafts and smelting facilities. An Egyptian temple here at the base of the Pillars of Solomon was converted into a shrine by the Midianites who used curtain coverings similar to the Tabernacle of Israel. In 1969 archaeologists found a five inch cooper serpent in the holy place of this shrine. These archaeological discoveries give the impression that the passing by of the Israelites with their Tabernacle and the incident with the fiery serpents and the cooper serpent on the pole left its impression on the people of this area. 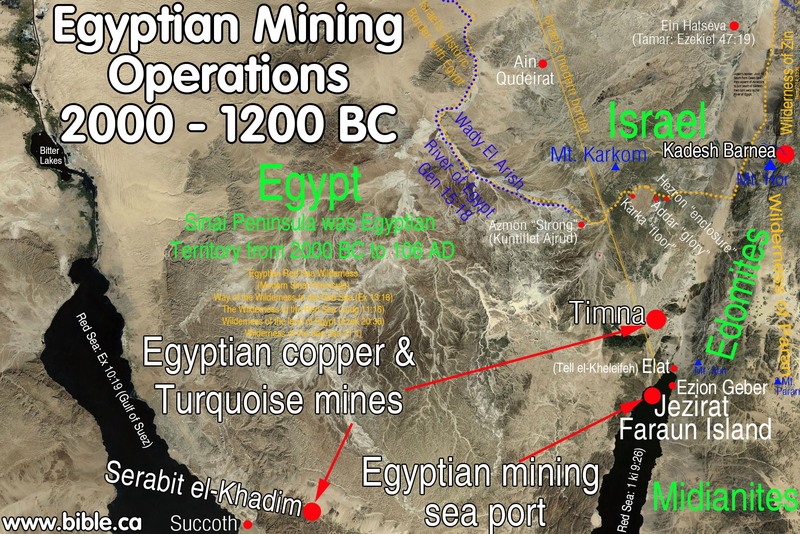 Not to mention the fact that copper was readily available at this stopping point of Israel’s wilderness journeys. "Sound doctrine does not enter into a hard and disobedient heart." Deiknumi (Gr) – Show (Eng) – deiknumi is a Greek word that means “to show,” “to exhibit,” and carries the idea of “to show by making known.” Deiknumi is used in Matthew 16:21; 1 Corinthians 12:31; Revelation 22:6. In 705 BC Assyrian King Sargon died and was replaced by Sennacherib. At this time 2 Kings 18:7-8 says the Lord was with Judah’s King Hezekiah (Ahaz’s son) who rebelled against Sennacherib and invaded the Philistines. The annals of Sennacherib record King Hezekiah by name a couple of places when it says he took the Philistine King Padi (or Padiah), of Ekron, captive and imprisoned him in Jerusalem. Do I realize that complaining is both habit forming and it has a tendency to intensify? Complaining is self-destructive and rarely reverses itself or resolves problems. The cycles of society in the Book of Judges. 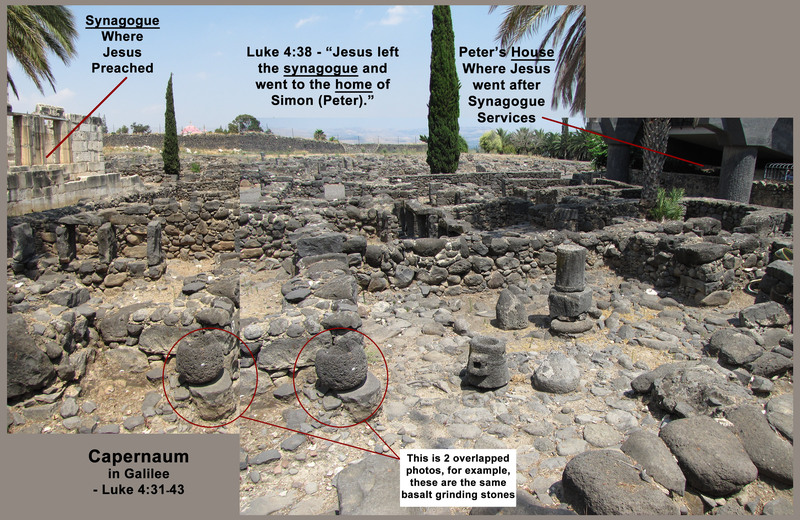 In Capernaum the synagogue where Jesus spoke in Luke 4:31 can still be seen. 84 feet away from the synagogue is the remains of Peter's house where Jesus went after the synagogue service in Luke 4:31-43. 360 panorama inside the Capernaum synagogue.